VisiCorp (formerly Personal Software Inc.) announced the VisiSchedule program. The new program increases to nine the number of interrelated personal computer software products in the VisiSeriesTM family. The VisiSchedule program allows the user to create an onscreen schedule of projects and tasks. The displayed schedule responds immediately to "What if?" schedule detail changes and shows the effect of the change on all subsequent events. The VisiSchedule program immediately updates its information on-screen when a change occurs; and it incorporates all pertinent data including costs, manpower, resource leveling and scheduling constraints. The timechart and other reports produced by the VisiSchedule program provide valuable information to any business involved in planning projects and managing resources. Managers, executives, engineers and manufacturing personnel can profitably use VisiSchedule to track any project in which deadlines and a schedule of events are important. The program has been designed for ease of use. With its "moving cursor menu," the user need only point with the cursor to each command. The user is then guided through each step, developing the project as it is being entered; no preplanning is necessary. 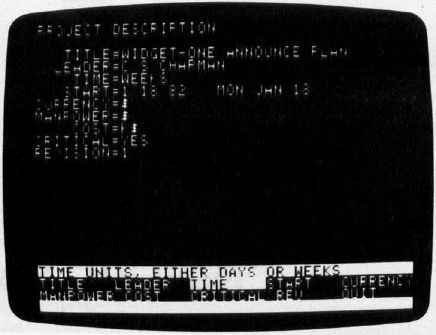 Like other members of the VisiSeries product family, the VisiSchedule program may send data to the VisiCalc, VisiTrend/ Plot or VisiFile programs. A calendar representation of start and stop dates, slack time, holidays, and deadlines for up to 160 different tasks may be displayed and automatically printed out. Many different computer-generated reports in an almost unlimited combination of information may be produced. Such information includes critical path, project milestones, cost estimates, manpower levels, slack time, number of successors, durations, earliest start dates, late finish, deadlines and prerequisites of all or some of the project tasks. The interactive time chart and reports allow a user to investigate the tradeoffs among manpower, dollars and time. 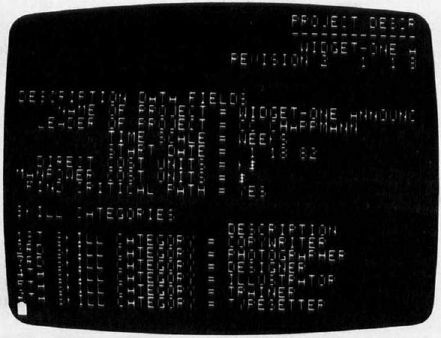 The VisiSchedule program requires an Apple II or II Plus computer with a minimum of 48K memory and two disk drives. A printer is strongly recommended. 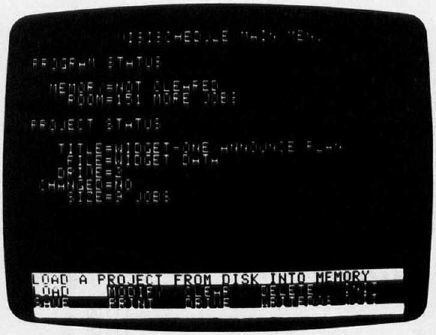 A 48K computer can handle up to a 50-task project; adding the Apple Language System or Microsoft RAMcard increases this capacity to a 160-task project. Price and Availability: Suggested US price of VisiSchedule is $300. It has been available since mid-February. The VisiScheduleTM program automatically loads details from the previous use of the program. The user tan re-load a project schedule already set up, or create one from scratch. Current date, person preparing report, current status of last project worked on can he checked. This displays the work schedule itself. The user may scroll in all four directions to view the entire project. Simple menu commands add, delete or rearrange jobs. 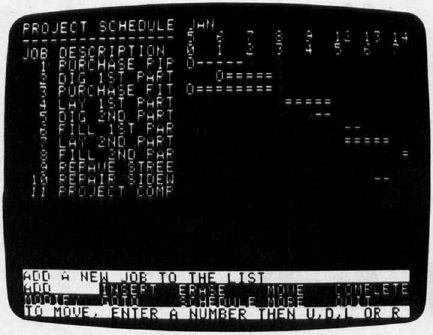 As each job is entered, it is displayed on screen. Once jobs are entered, manpower peaks may be auto leveled, costs and manpower levels are displayed or the project schedule adjusted in many ways. The Modify Menu allows the user to create or change the overall description of the project. Such items as title of project, leader, currency, cost levels and revision number can all be changed. Modify is where the user sets up manpower, skills, costs, holidays and the work week. The moving cursor anticipates the next entry so that keyboarding time is reduced. Ihe VisiSchedule program prints a wide range of useful reports, including summary of the entire project, critical path, project milestones, manpower and cost estimates, job descriptions, tabular reports and sorted reports. The reports stay current because you can complete jobs, slip the project or make any changes to snow what is really happening.